Doreen and I are very pleased to announce to you the addition of Dave Murray as our US Executive Director. We have been praying for the one whom God would send to be our Executive Director and lead the development of our national organization in the United States. After a thorough process, we have decided that Dave has the work experience- both secular and ministry-related- and the heart, to be our Executive Director. We have offered him the position and are blessed that he has accepted. Dave was on our original target list of candidates almost two years ago when we began our recruiting process, as his name was brought to our attention by several of our friends in the Phoenix area. At that time, Dave was on the staff of North Phoenix Baptist Church as Executive Pastor/COO, assisting them with the transition to a new senior pastor. Dave shared with us at that time that he and his wife, Tracey, knew God was continuing to work in their lives and preparing them for something new in the future, but believed God wanted them to stay in their current role to be a part of a successful transition in their church. Over the last 18 months, the transition at North Phoenix has been completed. Dave had the opportunity to lead a team from North Phoenix for Impact Ndola 2013 and God continued to work in the lives of Dave and Tracey, and prepared them for us just as Northrise found itself in need of an Executive Director. God’s timing is perfect! Dave’s credentials bring much to recommend him for this position. Dave served as Executive Pastor and Chief Operating Officer of North Phoenix Baptist Church for the last nine years. In his role, he was responsible for the overall operations of a $30M infrastructure and a $5M annual operating plan. He also provided oversight of human resources, financial management, communications, staff coordination, vision and strategic implementation, including two successful community outreach ministries. Prior to joining the staff at North Phoenix, Dave spent 14 years with JP Morgan Chase and its predecessor companies in various positions including financial management of retail and commercial banking, national operations, and business development. Dave’s last position before leaving JPMorgan for full-time ministry was as First Vice President, Portfolio Acquisitions Manager for Chase Home Finance. Dave is also a Certified Public Accountant having experience with audit, tax and business consulting in various industries. Dave served in the US Air Force as an Aircraft Crew Chief, and is an honor graduate of the USAF NCO Leadership School and USAF Technical School. Dave received his undergraduate degree in Accounting from Arizona State University and his MBA from the University of Phoenix. Dave and his wife, Tracey, have four children and four grandchildren and have lived in Phoenix for over 28 years. Tracey is an RN and school nurse in the Deer Valley school district. Dave’s friends and colleagues also recommend him without reservation. His pastor and trusted friend of over 20 years describes him as being “smart with a heart”. A ministry peer, close friend and staff member adds that he is a “visionary leader, fair and intuitive in his concern for people and understands the communication necessary to lead a growing organization”. Effective January 1, 2015, as US Executive Director, Dave will direct the Northrise University Initiative (NUI) organization, a US-registered 501(c)(3) organization, and focus his efforts on friend-raising and fund-raising opportunities, such as chapter development and expansion of the Student Scholarship Program, to achieve and extend the vision of Northrise University. Additionally, Dave will work with the Northrise Board of Trustees in facilitating the capital fund-raising effort, and with Northrise University faculty and staff to coordinate US efforts for specifically-identified programs, involving NUI’s support. We look forward to what God will do in the US through Dave Murray’s leadership as we implement our national strategy and continue to be obedient to the vision God gave us for Northrise University. We give Him all the glory, fully realizing that Northrise University is God’s creation, not ours. And all that Northrise is today and will be in the future is because of God’s favor and blessing on Northrise. Please join Doreen and me in welcoming Dave to Northrise. 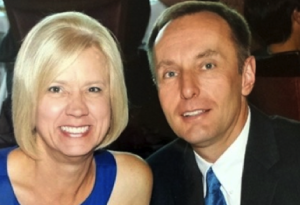 I ask you to pray for Dave and his wife, Tracey, as they join the Northrise family, and that you would fully commit to supporting Dave as our US Executive Director.